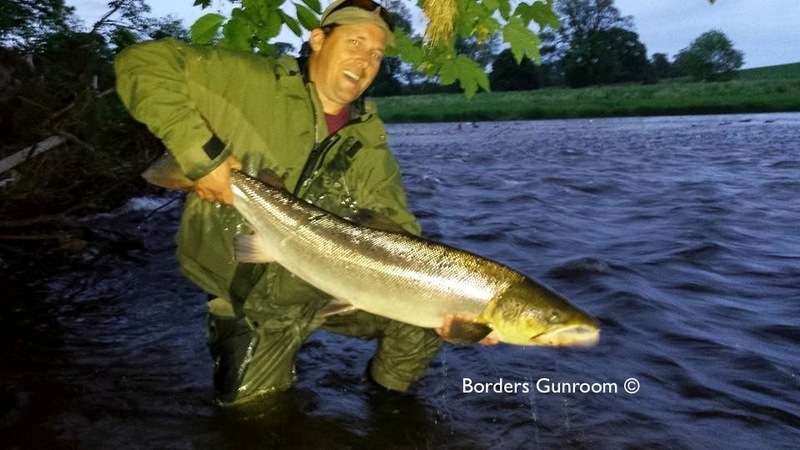 Iain Wilson from Borders Gunroom fishing Mertoun on Middle Tweed yesterday enjoyed a once in a lifetime red-letter-day. Fishing the morning session Iain caught two salmon and so decided to go back in the evening with his colleague Brian. The evening session started well with Brian quickly connecting and landing salmon at 15lb and a sea liced fish at 8lb. As the evening progressed, Iain changed his rod so he could focus on the sea trout entering the beat. Using a single handed Hardy Swift 10ft 7″ perfectly matched with a Loop Classic 5/8 reel, Rio Outbound short head line with 13lb seagar and a bespoke handmade fly called the Silver Munro he connected with sea trout and then quickly lost a few. The fish measured 111cm and the size has been verified by the Tweed Foundation at 32lb. Iain said the fish has been in the river for approx six to eight weeks. This fish along with the Hendersyde salmon in May are significant for the river because of their genetic make-up. They stay at sea at least a year longer, are 3 to 4 sea wintered fish which are less frequent and hence highly prized.